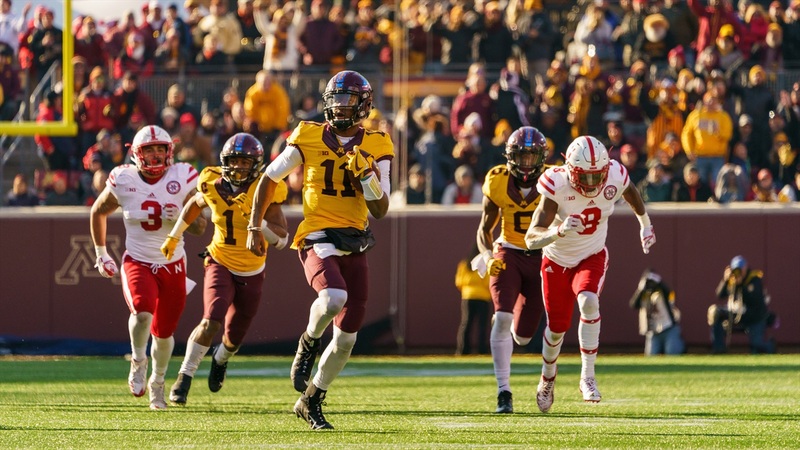 Nebraska gave up 54 points and 409 rushing yards to Minnesota on Saturday. Sophomore Demry Croft accounted for 183 of those yards, setting a new school record for rushing yards in a game by a quarterback. 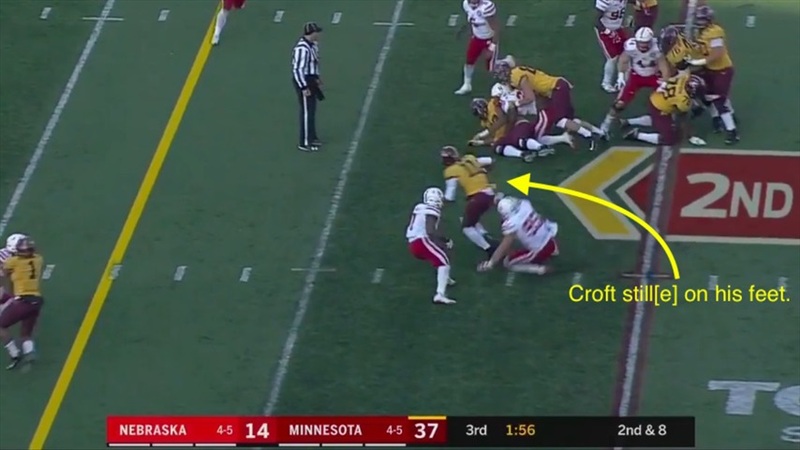 Take away the one sack Nebraska managed in the game, and Croft actually rushed for 197 yards. Even worse, he did that on just nine runs. 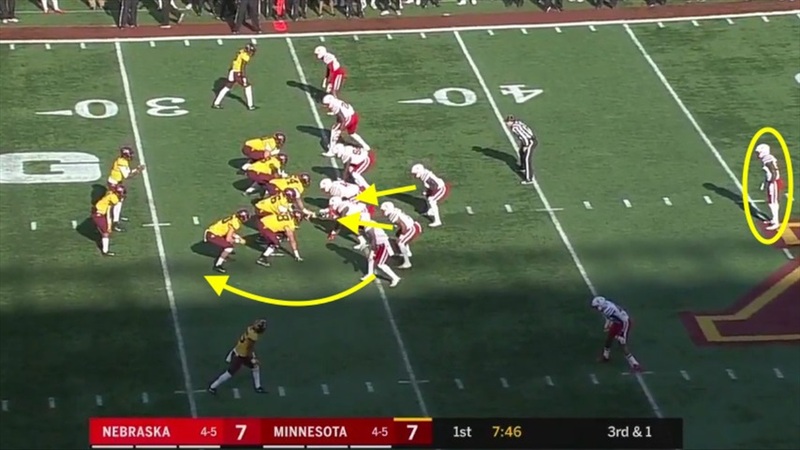 The Huskers struggled to handle the mix of zone read and sprint option that Minnesota threw at them. Actually, "struggled" is probably a bit of an understatement. Let's dive into the tape to find out what the heck happened. 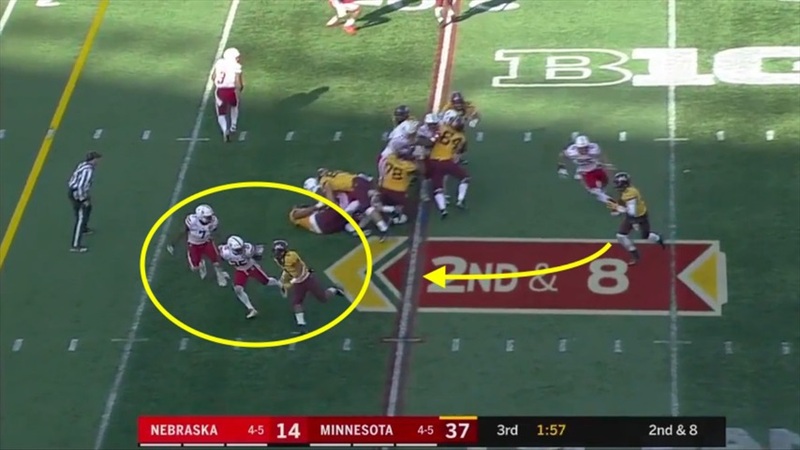 Nebraska's first defensive drive of the day showed it was going to be a long game for Nebraska as the Golden Gophers marched right down the field for a 12-play, 75-yard touchdown drive that included three runs by quarterback Demry Croft plus an option pitch. 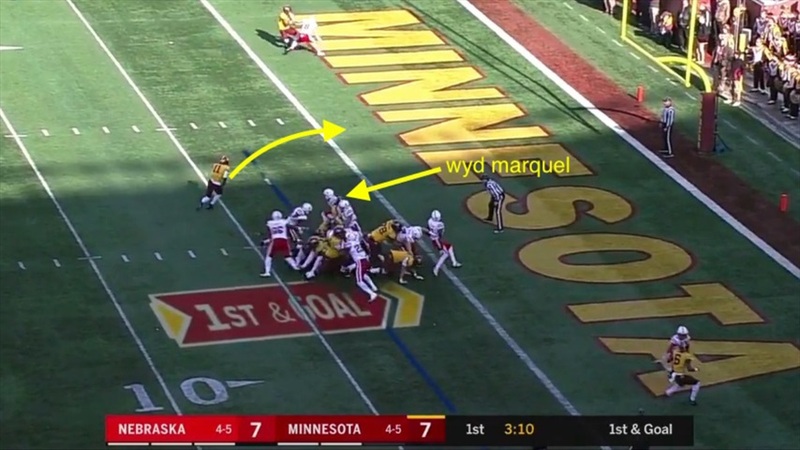 Two plays into the drive, Minnesota faced a third-and-1 from its own 34-yard line. 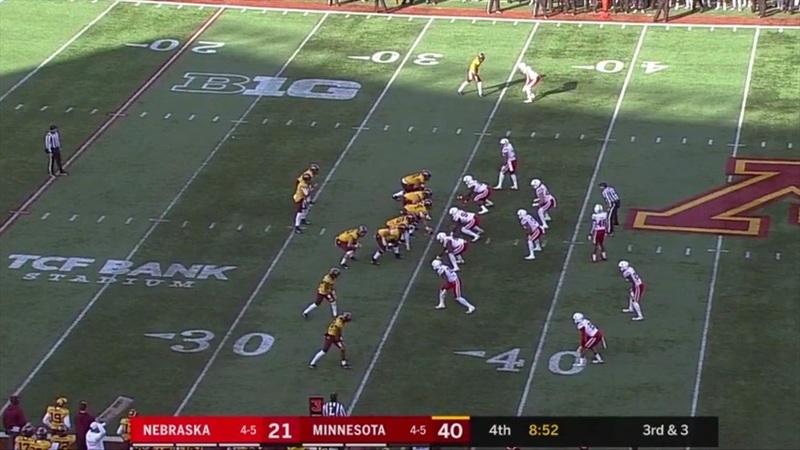 Nebraska lines up in man free with a safety 11 yards deep up the middle. Field outside linebacker Marcus Newby rushes off the edge while the inside linebackers plug the gaps up the middle. 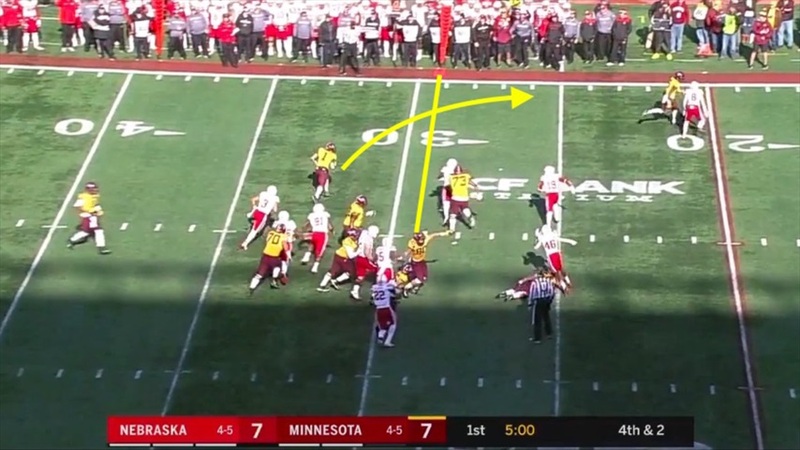 Minnesota runs a zone read. Croft sticks the ball into running back Rodney Smith's stomach to create the mesh pont and reads the free rusher, Newby in this case. Newby has his eyes on the back. Croft reads it and decides to pull the ball out and keep it himself. Notice how deep Reed still is and how much space in the middle there is on third-and-1. Croft takes over and crosses the line to gain before Reed even pulls within 5 yards of him. 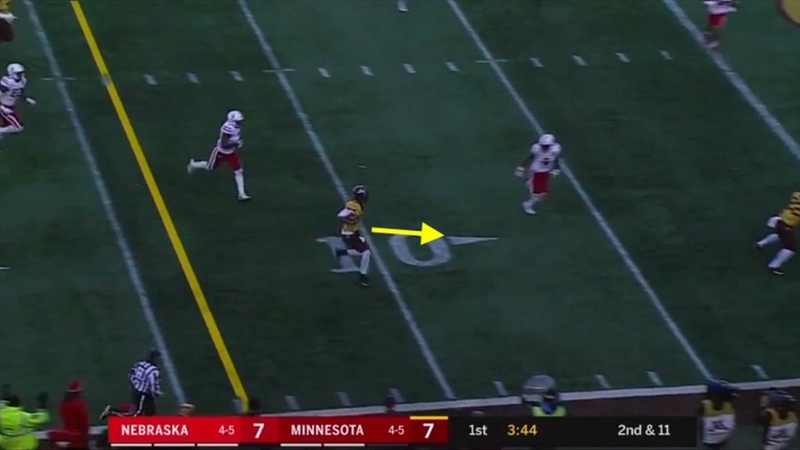 Croft turns on the jets and reaches the 40 before Reed can get a hand on him, and the safety just barely gets him tripped up as Croft falls forward for another 4 yards. 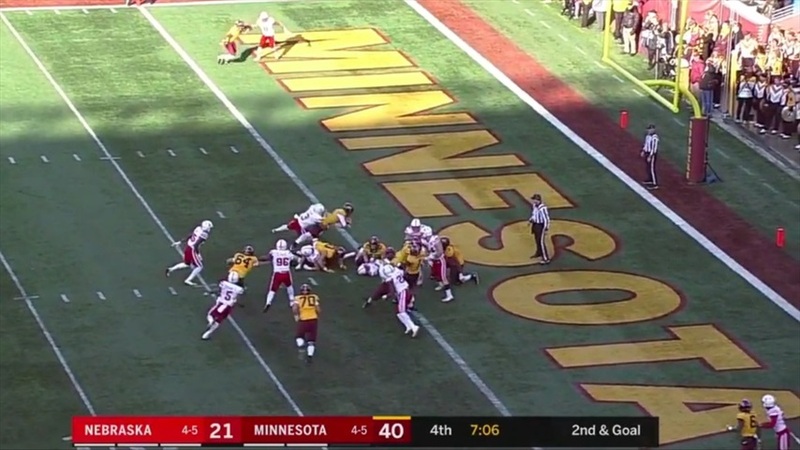 On third-and-1, Minnesota picked up 10 yards because the man responsible for covering the quarterback run started 11 yards deep in the secondary. 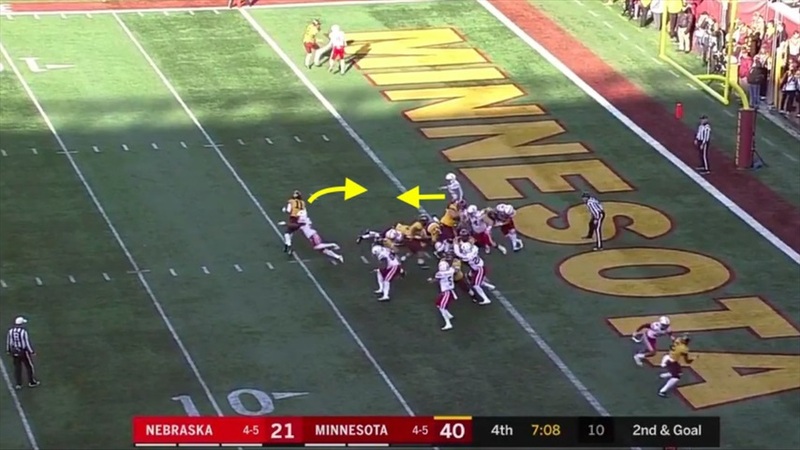 Minnesota continued to move the ball down the field, but a tackle for loss on third-and-1 set up a fourth-and-2 at the Nebraska 31. 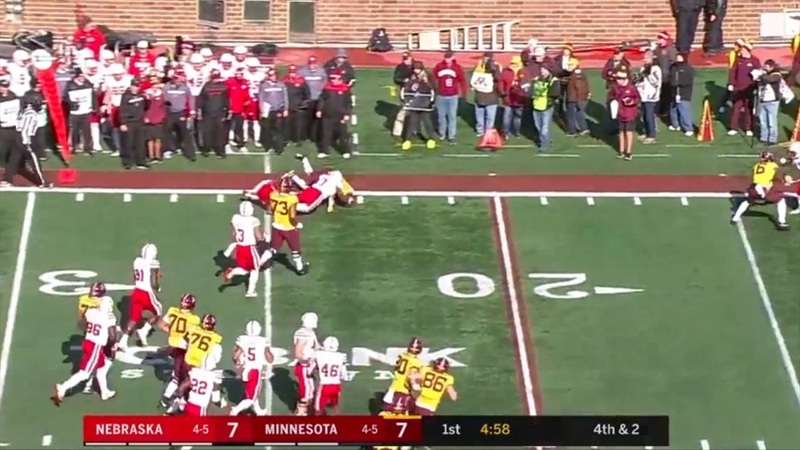 Minnesota went for it and called a sprint option to the field side. Once again, Newby is the man coming off the edge that Croft has to read. 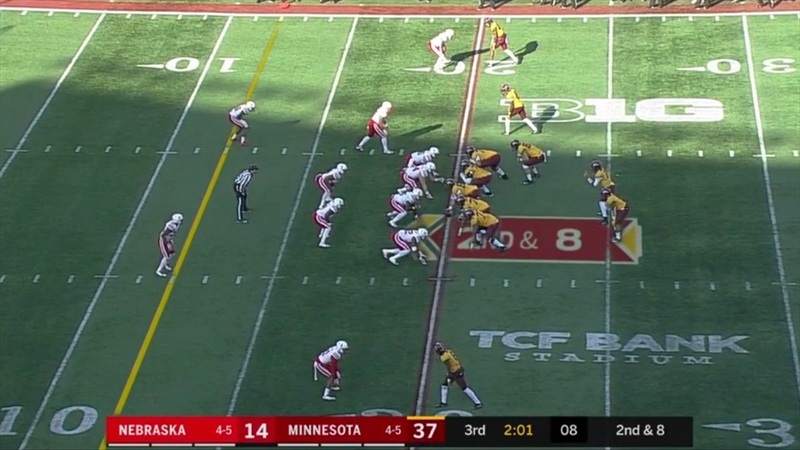 Notice where Marquel Dismuke (19) and Mohamed Barry (7) are lined up, both basically over the A-gap. 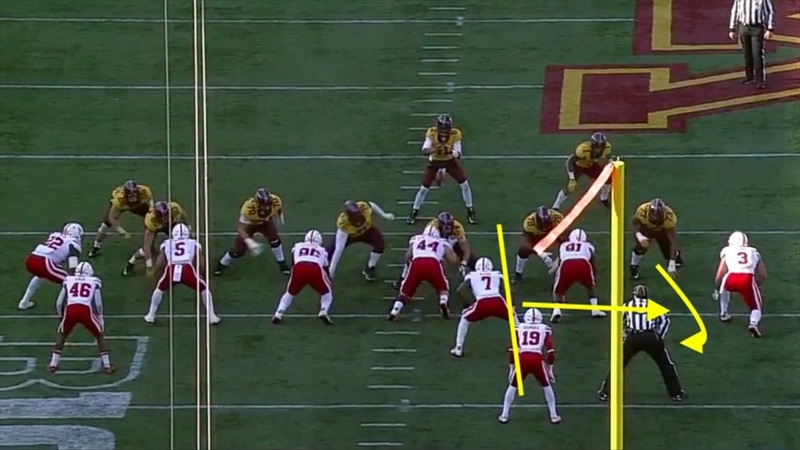 This alignment allows the left tackle to get to the second level and slow down Barry. Newby rushes at Croft, so the quarterback pitches to Smith. Barry gets tangled up with the tackles and can't get to the edge, and Dismuke is still behind him. A running back is going to win a foot race against most linebackers, and Smith does so here with Barry to easily pick up the first down. Dismuke eventually cuts him down and Barry falls on top of him, but the drive continues after a 7-yard gain. 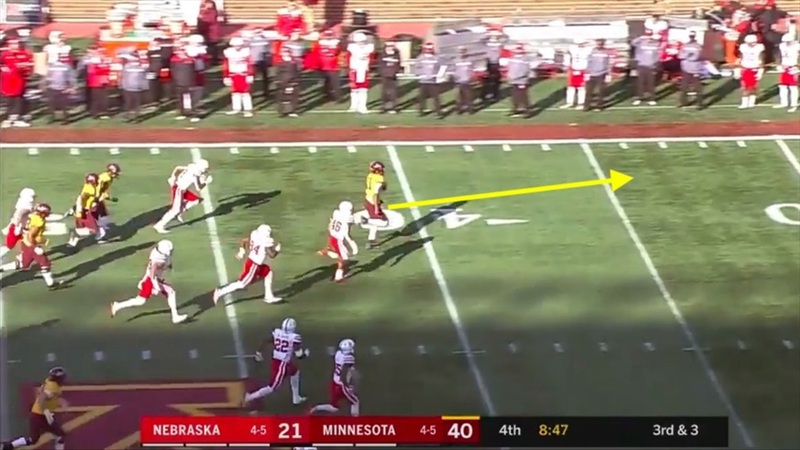 Once again, Nebraska's alignment made it almost impossible to prevent the first down because the man responsible for the ball-handler is coming from so far away. Barry recorded a tackle for loss on the next play, setting up a second-and-11 and putting the Huskers in great shape. 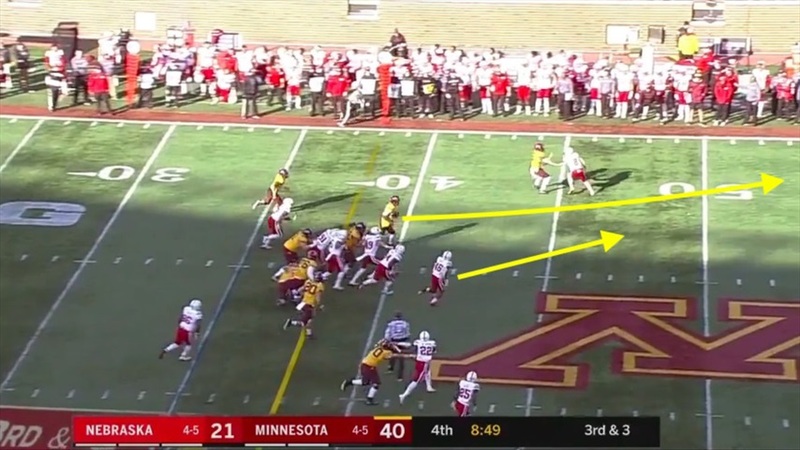 Minnesota calls a pass play, but the Huskers have all the receivers pretty well covered. Barry is spying Croft. 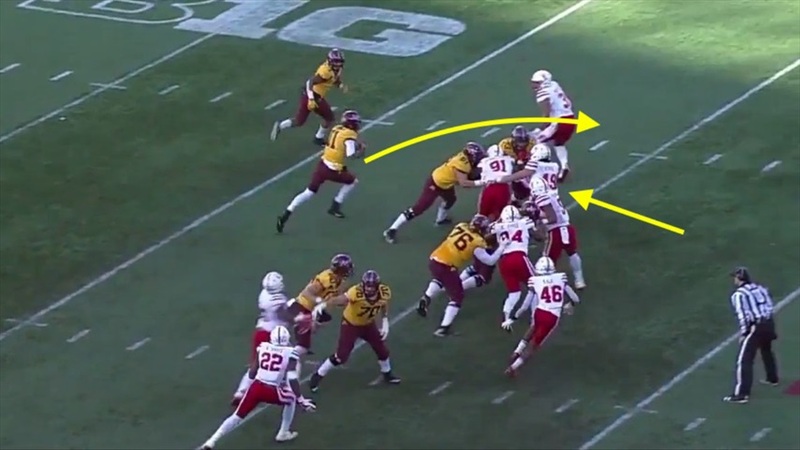 Seeing no one open, Croft pulled the ball down and took off to his right as the Huskers have a man there to shut down the escape to the left. For some reason, Barry starts going the opposite direction. 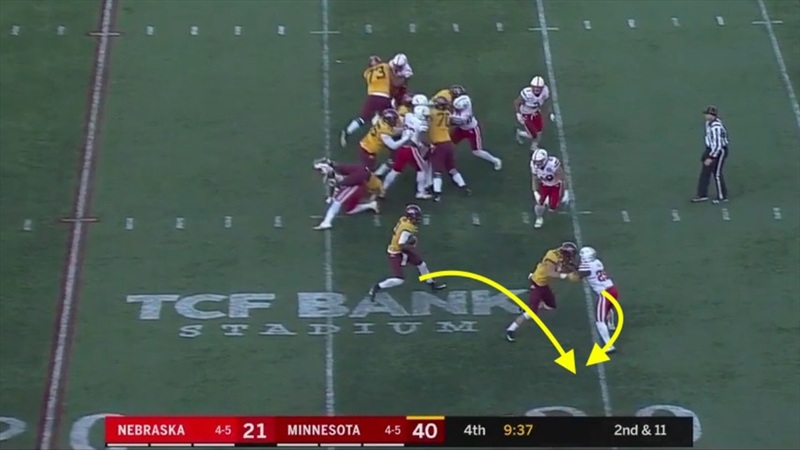 Barry realizes where Croft is and tries to turn around, but now he's playing from behind and that's not a situation that favors Nebraska. 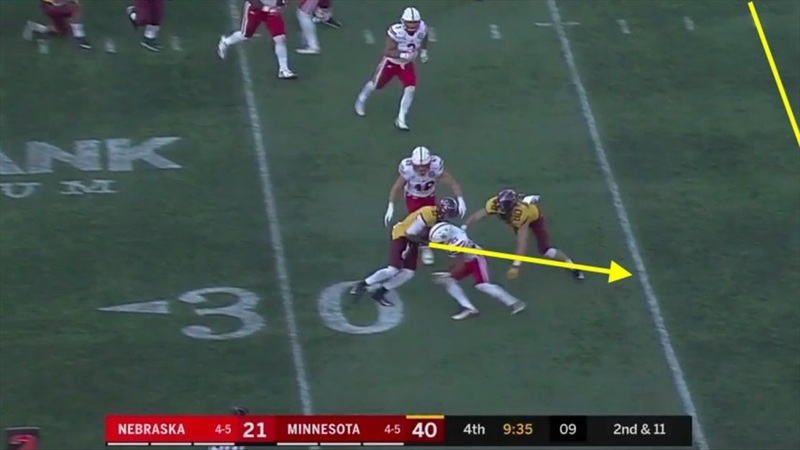 There's the first down and Croft still has some room to run, although Chris Jones saw what was happening and peeled off his coverage responsibility. 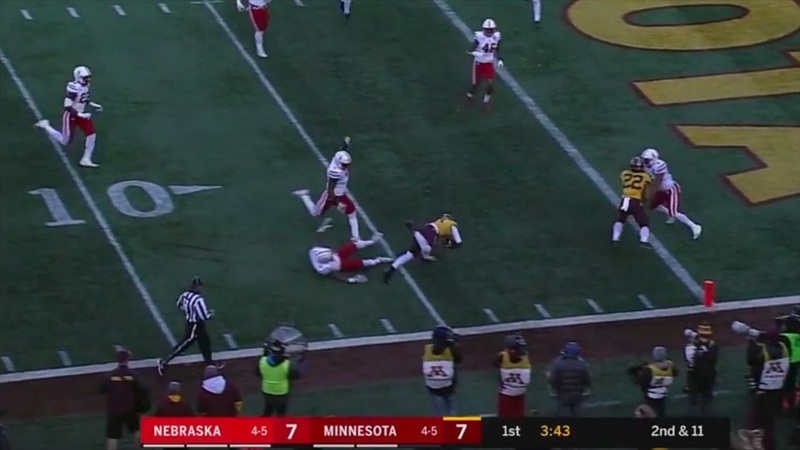 Jones manages to trip Croft up to prevent the touchdown, but a second-and-11 turned into a first-and-goal from the 3. 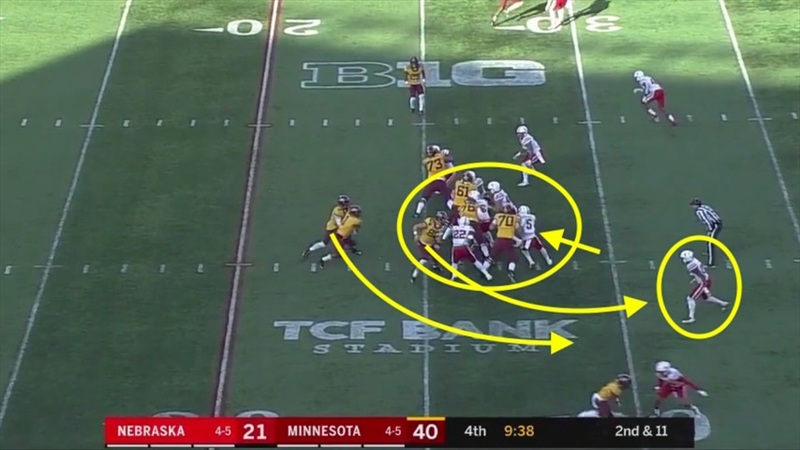 Minnesota breaks out the zone read again, and this time safety Joshua Kalu is the free rusher off the edge. 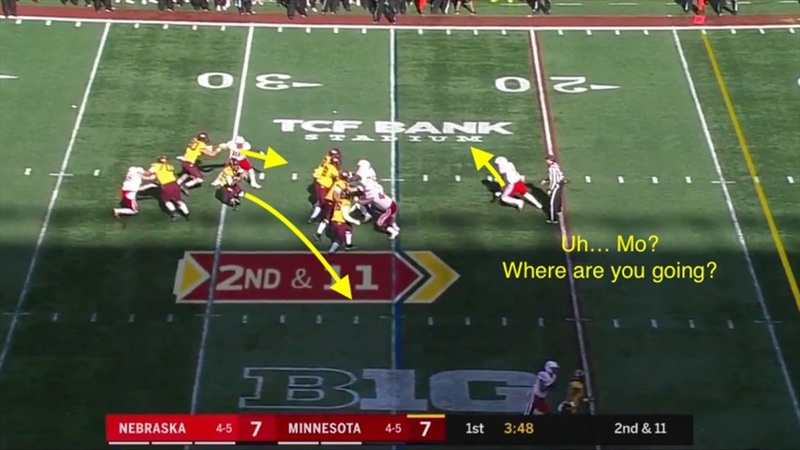 At the mesh point, Kalu attacks the running back, so Croft keeps it. Dismuke, instead of covering the quarterback, starts moving forward. I have no idea what Dismuke was doing. That's Croft over to the left with the ball in his hand and no one near him. Easiest touchdown of Croft's career. To review, that is 35 yards and a touchdown on three carries for Croft plus a pitch to Jones that moved the chains on fourth down. I already broke this play down in my weekly Play of the Game post, so go check it out there. I'll give you a minute. All right, are we back? I just have one more thing to add. Check out the angle of Dismuke's head here. His responsibility is the quarterback, but it looks an awful lot like his eyes are on the running back, or at least the mesh point here. 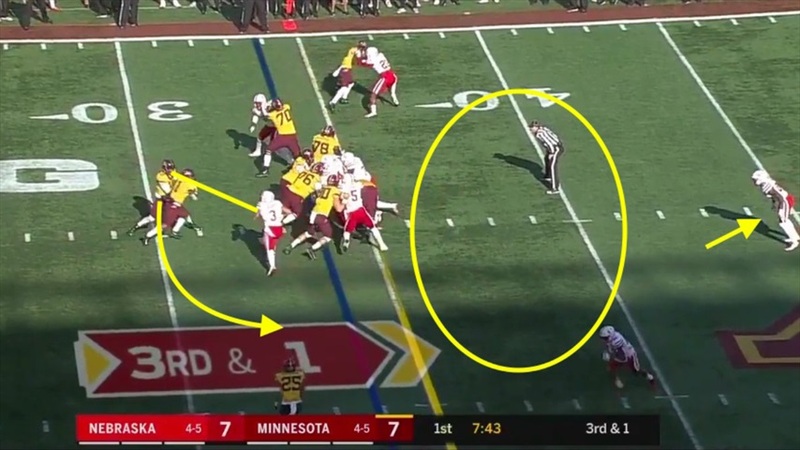 He shifted his focus back to Croft when he realized he had the ball, but was off balance in a terrible stance because he wasn't ready to make the play. Fast forward to late in the third quarter. 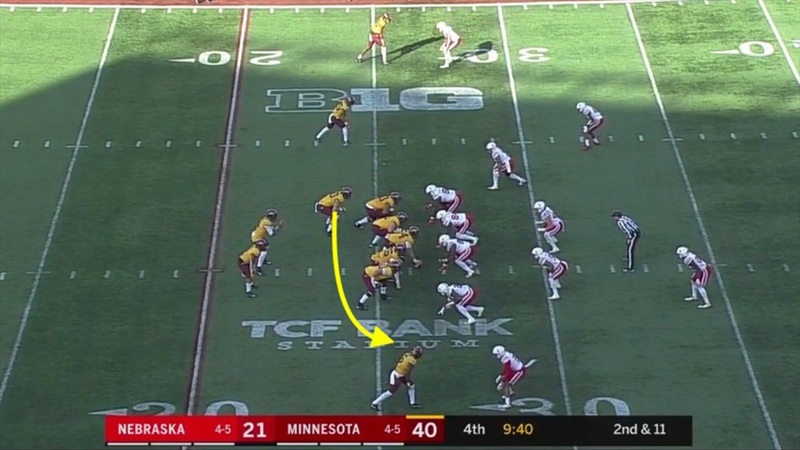 Nebraska limited the Gophers to 2 yards on a first-down run, putting the defense in a good spot once again. 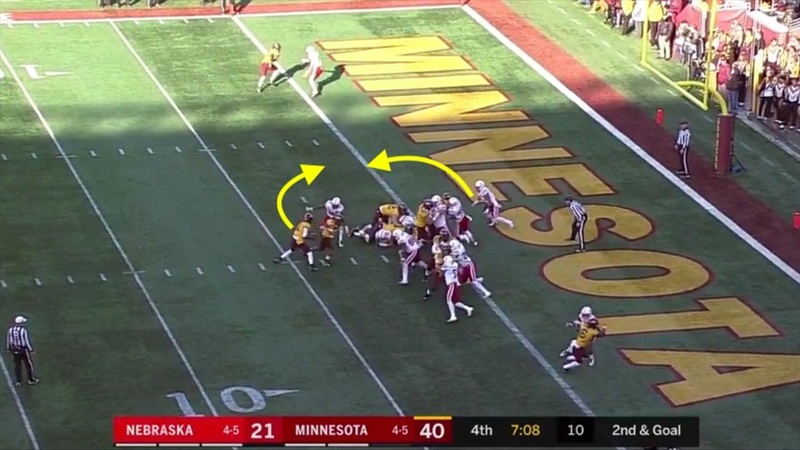 Minnesota runs a play-action roll-out to the left. Reed (circled) creeps forward while Barry crashes into the line. For some reason, both Reed and Barry take off running after the running back. Meanwhile Croft still has the ball and pulls it down to head up field. That's Ben Stille trying to chase him down from the weak side. Barry realizes what is happening and drops out of coverage on the back to try to pick up Croft. Meanwhile, Croft made a cut and avoided the chase down tackle attempt by Stille. Barry's out of position to stuff him. Barry does manage to make the tackle, but he does it by taking his legs out from behind, allowing Croft to fall forward for a couple more yards. 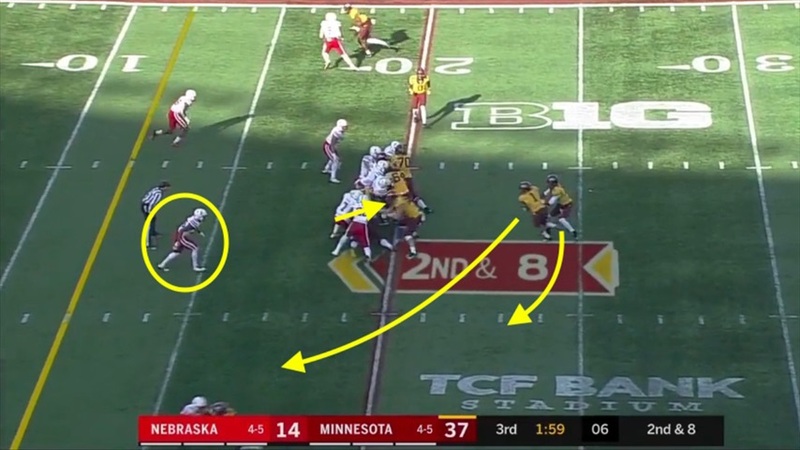 On second-and-8, Nebraska gave up 7 because the defenders involved with the primary threats did not appear to be assignment sound. 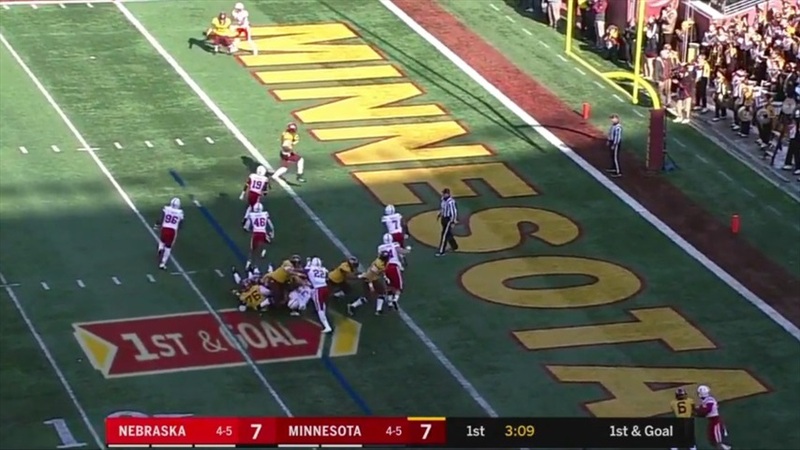 Fortunately, Nebraska does stuff the Gophers on third-and-1 to force a field goal. Unfortunately, that field goal made the score 40-14. 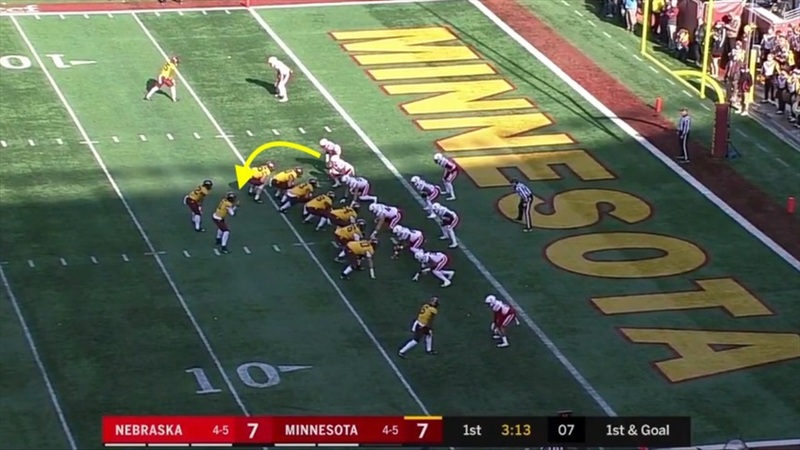 Chris Weber stuffed a run for a loss of 2 on first down, setting up a second and 12 at the Minnesota 26. 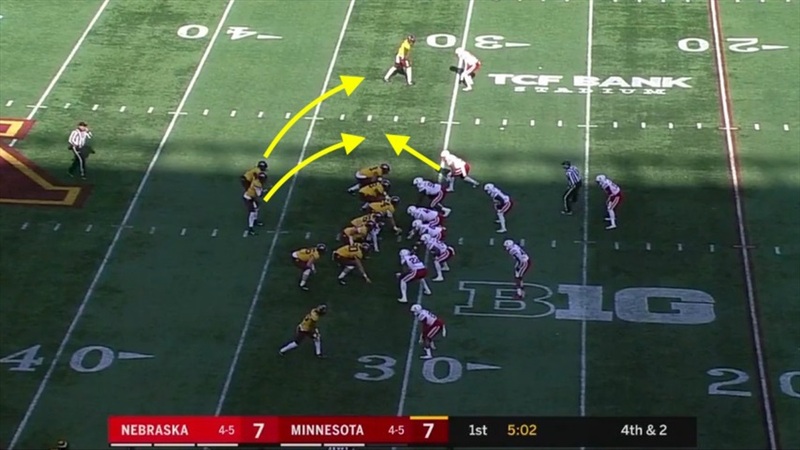 Minnesota ran another zone read and brought the tight end over from the left side to use as a lead blocker. Croft reads that there is nothing up the middle and pulls the ball to run to the right side. 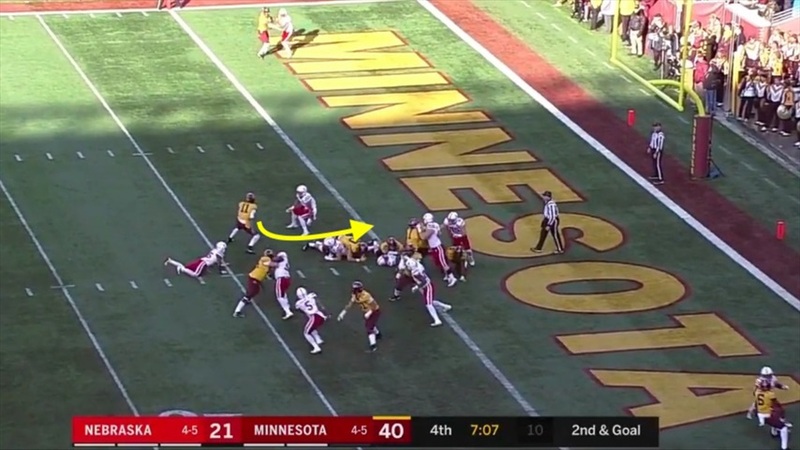 For some reason, Dedrick Young joins the mosh pit in the middle, leaving Reed on his own to deal with both the lead blocker and the ball carrier. 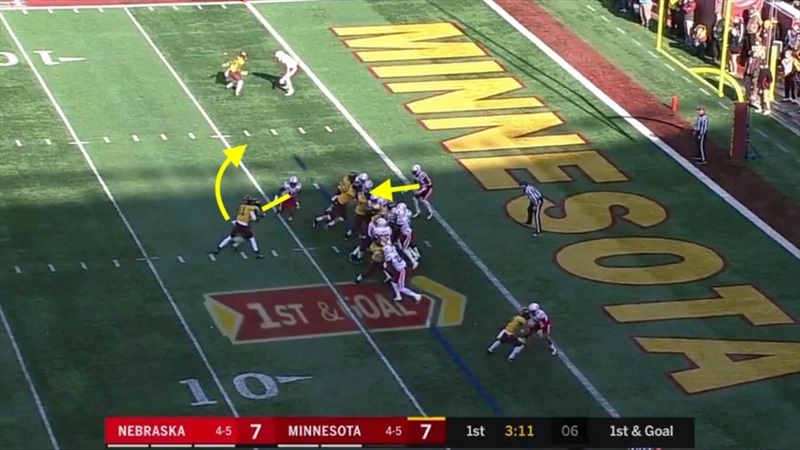 The tight end engages with Reed and Croft cuts it outside to avoid Weber coming over from the middle. Reed manages to get off his block and make the tackle, but once again Croft falls forward for extra yardage. 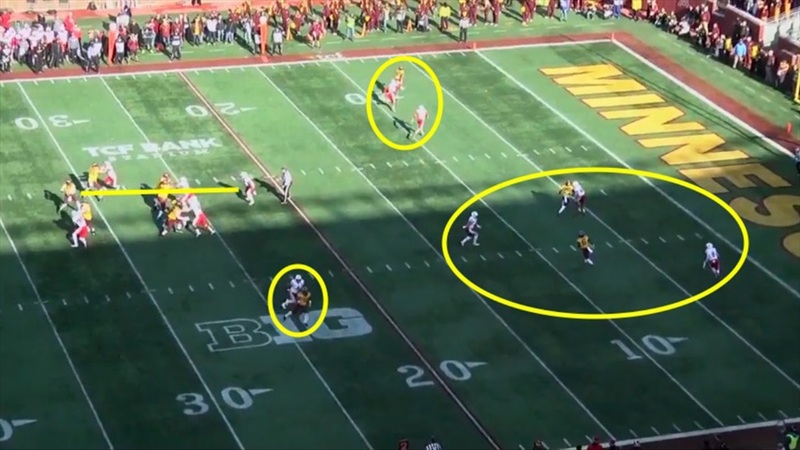 The play went for 9 yards, setting up a very manageable third-and-3. 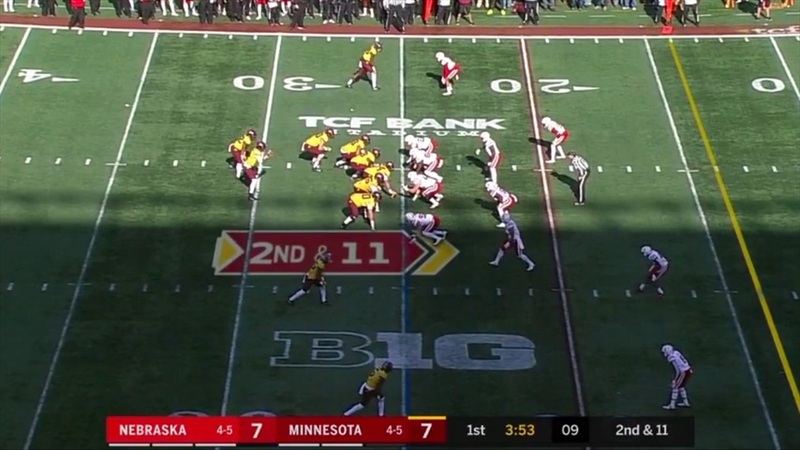 Minnesota goes back to the spring option. 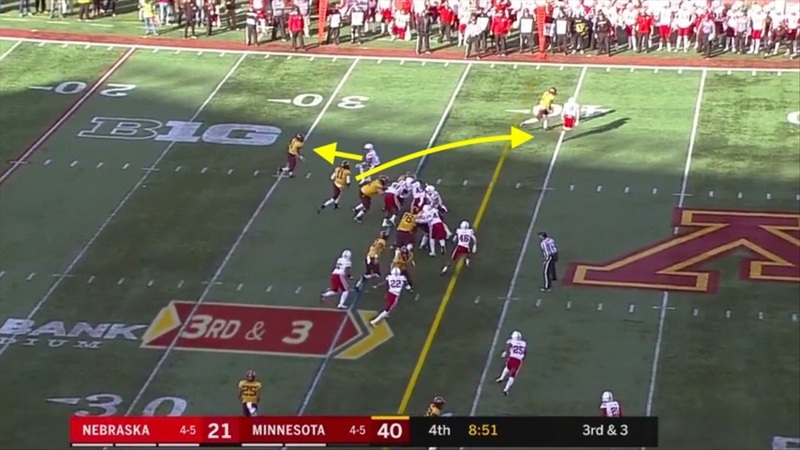 Newby targeted the running back out wide, so Croft kept it and took off upfield. 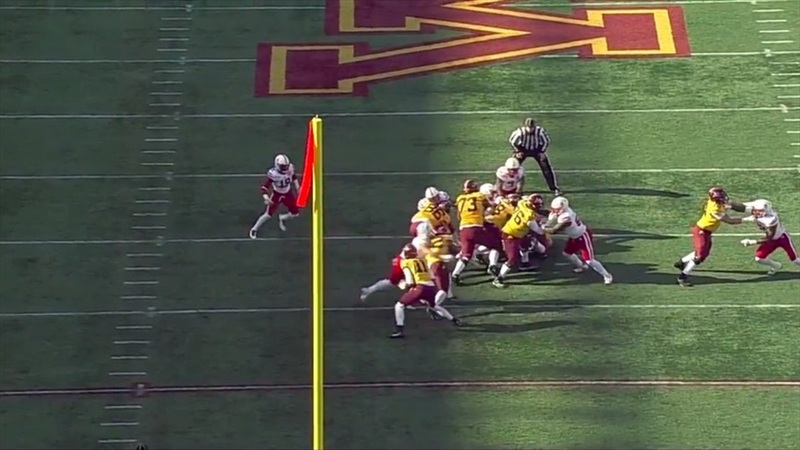 It's hard to know for sure who is supposed to be where but Weber is the nearest linebacker to the edge other than Newby and he gets caught up on a blocker and can't get to the edge. Kalu, the nearest safety, is on the other side. With a blocker ahead, Croft busts through the hole and is off to the races. Kalu has to try to catch him. 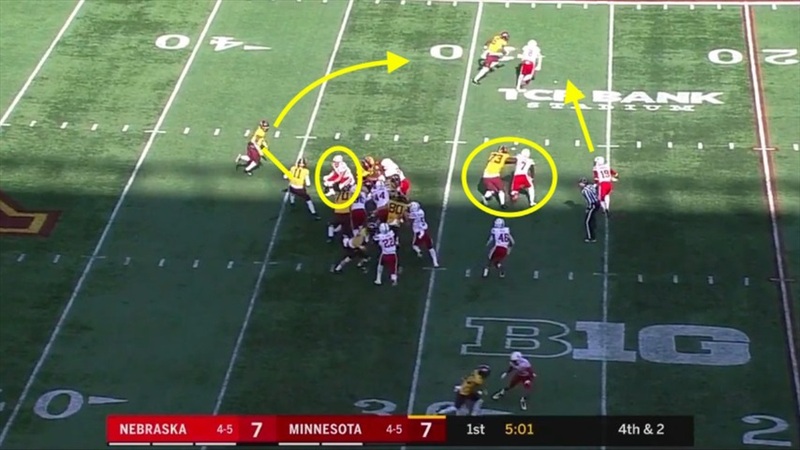 Croft has a pretty good set of wheels for a quarterback and picks up a big chunk of yardage. 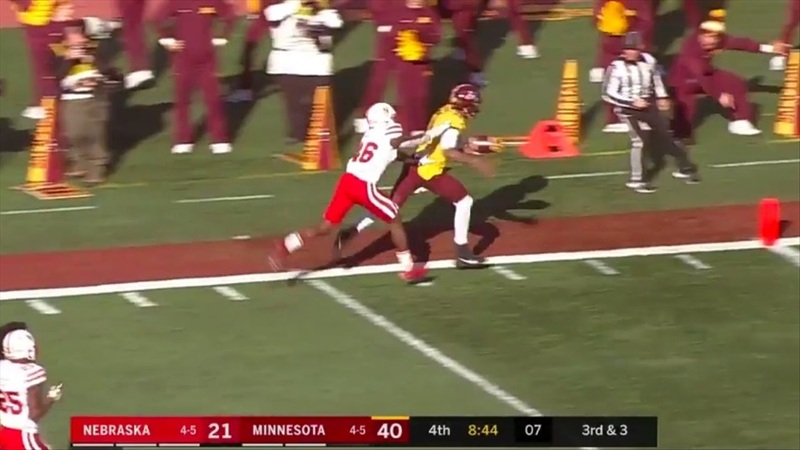 Kalu finally catches up and shoves him out of bounds at the 1. Croft gained 64 yards and it was only his second longest run of the day. 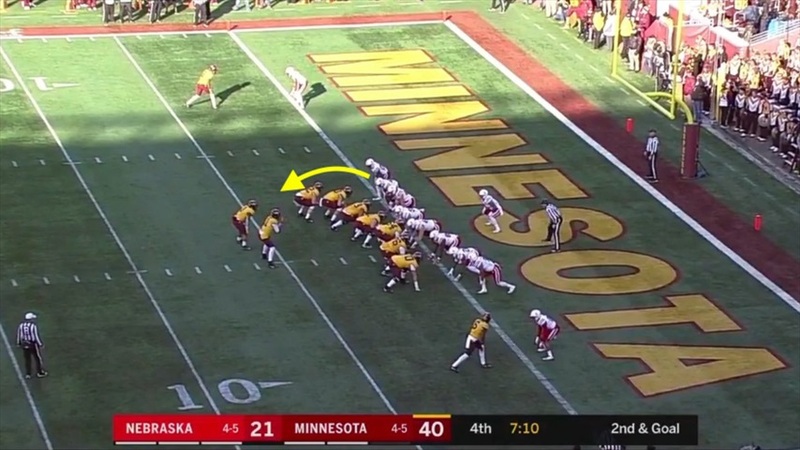 Minnesota got whistled for a false start, bumping the Gophers back to the 6, but Smith picked up 5 yards on first down, getting them back to the 1. 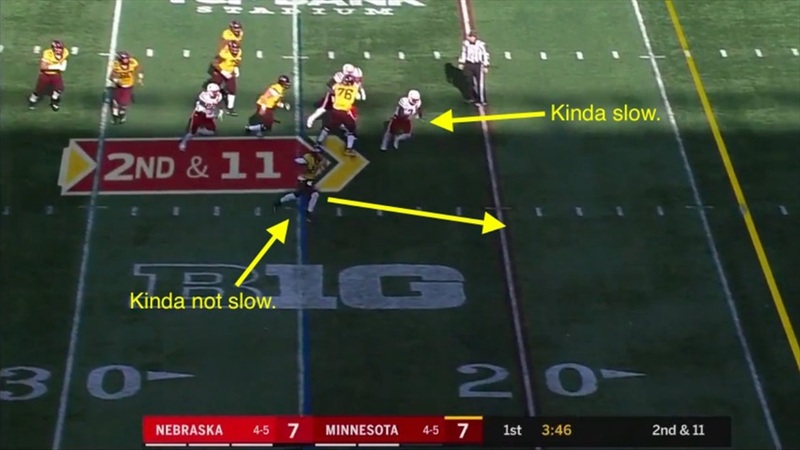 Zone read again, and Kalu is rushing off the edge this time. Croft saw Kalu about to bury Smith and pulled the ball back out, heading for the edge. Newby sees him take off and heads that direction. 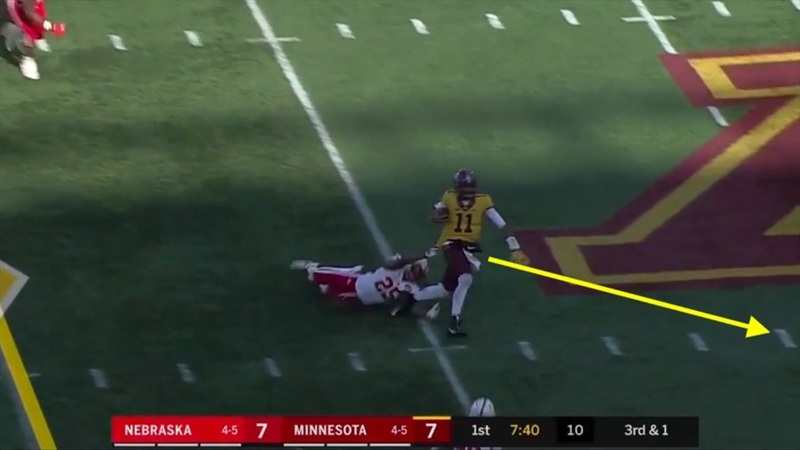 Kalu recognizes that Croft kept the ball and tried to lunge at him to make a tackle, but Croft brushes him off. Newby is still back in the end zone. It's one-on-one now. Newby breaks down, but is waiting for Croft rather than making the first move. Croft plants his foot and cuts it back inside. 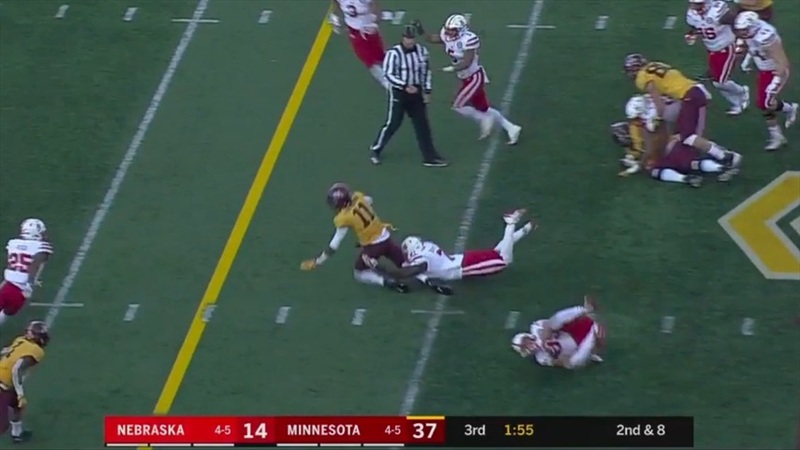 Newby got his hands on him but Croft dives forward, breaking the plane for his third touchdown of the day. 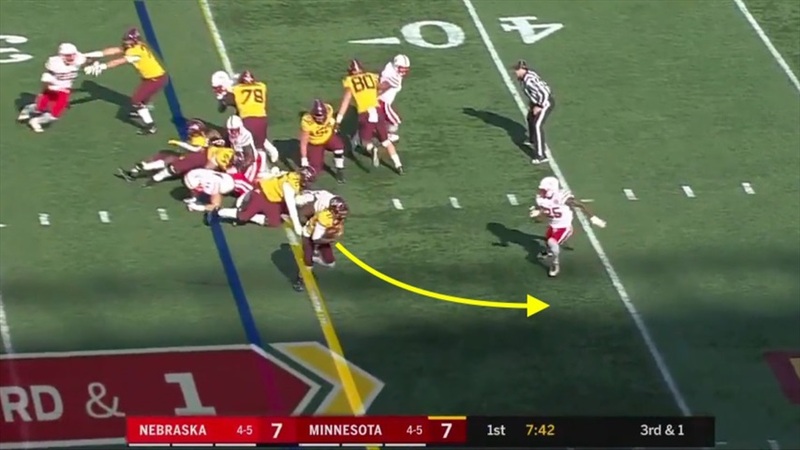 Minnesota gashed Nebraska all day with the quarterback run game en route to a school record-setting performance. Coach Mike Riley offered a bit of an explanation at his Monday press conference. Some times players were out of position. Sometimes they were not focusing correctly on fulfilling their specific responsibility. Sometimes they were where they needed to be and failed to make the play. All of that added up to potentially the worst defensive performance since I started covering Nebraska.